The Methodist Chapel in Kineton dates back to 10th October 1842, when it was registered for worship in the Court of the Bishop of Worcester. Within two years it appeared on the Circuit Plan for Banbury and in another two years, in 1846, the Chapel became the Kineton Circuit Church. On 13th March, 1865, the Chapel was first registered for the Solemnization of Marriage. Only twenty-three years after the Kineton Chapel was first registered, it was pulled down, in 1893. On Wednesday 21st June there was much rejoicing and celebration when the foundation stones for a new, larger building were laid. It is recorded that the Tysoe Band were present and there was a ‘somewhat lengthy address’. That evening, a further meeting was held and the collection taken contributed towards the overall cost of £920. Less than six months later, on Monday 4th December, the new Chapel was formerly opened. Shortly before the outbreak of the Second World War, it was decided by the Trustees of the Chapel that a hall should be added at the back of the premises but they had to wait until after the war was over before the two cottages and large gardens on the north side of the Chapel could be purchased to provide the necessary land. The Hall was eventually built by Briskers’ Builders and dedicated on Saturday 2nd October, 1954. In 1987, the Chapel underwent a major refurbishment and the hall followed in 1992, funded by the sale of Chapel Cottage and Gibbs Cottage as well as excess land at the rear of the premises where part of Battle Court stands today. 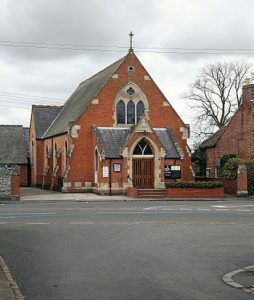 Since September 2009, the Church has been part of the newly-formed Mid-Warwickshire Circuit.